VOL. I. THURSDAY, 27TH DECEMBER, 1956. No. 28. WINDWARD ISLANDS No. 578 LONDON, S.W. 1.
take other work if it does not conflict with their responsibilities as Ministers ". should, as far as practicable, be followed by Ministers in the colonial territories. should be aware of the code of conduct which Ministers can reasonably be expected to observe. interest might, even conceivably, come into conflict with their public duty. to him as a Minister, for his own private profit or for that of his friends. in regard to which he has an undisclosed private interest. mav have, an advantage over other people in anticipating market changes. fied that their retention is not contrary to the public interest. February or early in March, 1957.
ef. No. P. F. 672.
before Parliament on the same date. 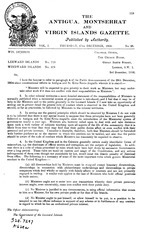 force on the 1st July, 1956.
this and other documents in aircraft. of Laws (Repeal) Ordinance, 1956.
nance, 1956." 2 pp. Price 4 cents. 1956). 1 pp. Price 3 cents. 1 pp. Price 3 cents. Cornmeal Industry Loan of $96,000. 4o% per annum payable half yearly. fixed for the 21st February, 1957.
in Class 45 that is to say:-Cigarettes. will be from 9.00 a.m. to 12 noon. the grant of Letters Patent. plum puddings and condensed and evaporated milk. the date of their said Application. before the date of their said Application. ANGELO BARRETO of Bolans Village, Antigna, has applied for Registration of two Trade MTu ks. the date of his said Application. ded on the 16th day of October. A.D.
5.35 p.m. to 6 a.m. Jurors' List for the year 1957-(cont'd). Dated this 4th day of December, 1956. Registrar for the Antigua Circuit.. TERRITORIES (EASTERN GROUP) FOR THE YEAR, 1955. Assets and Liabilities as at 31st December, 1955.
the year ended the 31st December, 1955. The Currency Ordinance became effective with respect to coin from 1st July, 1955. Territories of the group has not been seen. .Ordinance, Chapter 35, No. 2 (Trinidad and Tobago). 4ture for the year has been duly authorised. -with the Treasuiy records, and that with Barclays Bank (D. C. 0.) confirmed by Bank Certificate. quarter, but none in the 2nd. No surprise survey was held. Executive Commissioner of the Board at Port-of-Spain. 8th June, 1956. Director of Audit. (Eastern Group) for the Year ended 31st December, 1955.
coins and the redemption of United Kingdom coins. The surplus was claimed and distributed in 1956..
drawn to the necessity for ensuring that Boards of Survey are held as required by the Regulatiors. Colonies to appoint Boards and cause surveys to be held before 31st December, 1955. Workmen's Compensation Ordinance, 1956, here- 24/1956. inafter called the Principal Ordinance. nance the following section shidl be inserted:- new section. Act, 1937, as amended, is hereby repealed." ANTIGUA. 2 Workmen's Compensation No. 33 of 1956.
proclamation published in the Gazette. (f) of the proviso to the definition of workman ". 17 In the second line and the marginal note. 24 Subsection (1) -in the fourth line of the second proviso. fifth line of paragraph (e). 34 Subsection (1)-in the fourth and tenth lines. Subsection (4) -in the sixth and seventh lines. by E. M. BLACKMAN, M.B.E., Goverinent Priter.--By Authority. the Governor by proclamation published in the Gazette. by E. M. BLACKMAN. Government Printer,-By Authority. Printed at the Government Printing Offioe, Antigua, Leeward Islands. by B. M. BLAOKMAN, M.B.E., (nvernment Printer.-By Authtority. SA 47/8-500-12.56. Price 3 cents.